The Afghan president is angered when the Taliban casts its new office in Qatar as a rival Afghan embassy. KABUL, Afghanistan — Hopes dimmed for talks aimed at ending the Afghan war when an angry President Hamid Karzai on Wednesday suspended security negotiations with the U.S. and scuttled a peace delegation to the Taliban, sending American officials scrambling to preserve the possibility of dialogue with the militants. Nevertheless, the militants’ attempt at a publicity coup clearly played to Karzai’s longstanding distrust of both the Taliban and the United States, who had announced Tuesday that they would pursue negotiations in the Qatari capital of Doha – at least initially without the Afghan government. It may have also given Karzai an excuse to try to head off the Doha talks, which he probably agreed to support only reluctantly and under U.S. pressure. 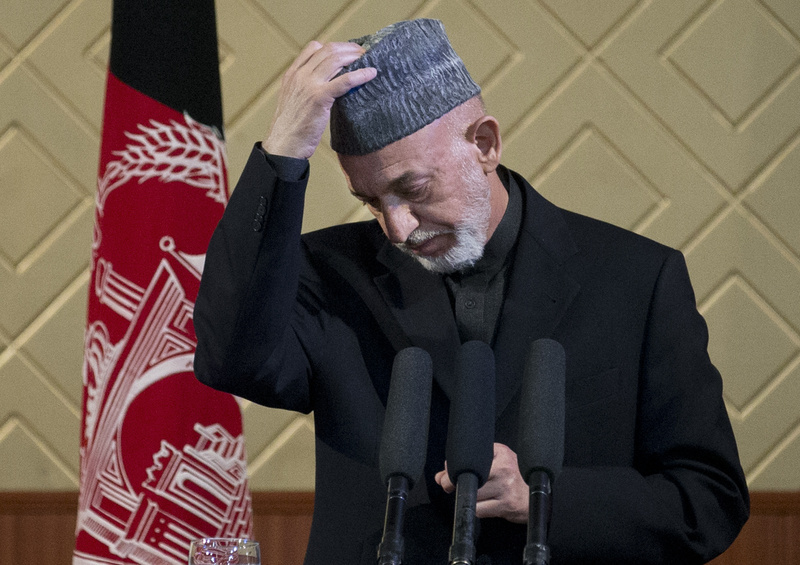 Karzai has for years opposed talks outside Afghanistan and dominated or directed by the U.S. The Taliban, on the other hand, have never really wanted to negotiate with Karzai, preferring to talk directly with the U.S.
“To have this whole ceremony, televised worldwide, without a single mention of the Afghan government having a role in whatever process is going to happen … they (Karzai and his peace delegation) suddenly realized, basically they weren’t out in front, they didn’t feature at all,” said Kabul-based analyst Martine van Bijlert. In a statement released by his office, Karzai lashed out at the U.S., using his leverage with Washington by suspending negotiations over what presence the United States will keep in Afghanistan after 2014. He also criticized the Taliban and insisted that they halt their attacks on the ground before negotiations can begin. But the Taliban appeared in no mood to lay down their arms. They claimed responsibility for a rocket attack on Bagram Air Base outside Kabul that killed four American service members late Tuesday. Five Afghan police officers were also killed Tuesday at a security outpost in Helmand province by five of their comrades, officials said, the latest in a string of so-called “insider attacks” that have shaken the confidence of the nascent Afghan security forces. Local official Mohammad Fahim Mosazai blamed the killings on Taliban infiltrators. The parallel statements and events in Afghanistan and Qatar left the Taliban looking stronger, Karzai appearing shaky and the U.S. doing damage control to find a political resolution to the war as troops leave. Karzai had said Tuesday that he would send representatives from his High Peace Council to Qatar for talks with the Taliban, presumably to be held a few days after talks were held between the Taliban and the Americans. But aides said he changed his mind after objecting to the way the Taliban announcement was handled. Shafiullah Nooristani, a member of the High Peace Council, told the AP that the reference to “the Islamic Emirate of Afghanistan” violated agreements that Karzai’s government had made with the U.S. and caused diplomatic issues for Afghanistan. “The agreement was that the office should open only – and only – for negotiations, not as a political entity like a parallel institution to the Afghan Embassy which is already there,” Nooristani said. In his phone conversations with Karzai on Tuesday night and Wednesday, Kerry reiterated that the U.S. does not recognize the name “Islamic Emirate of Afghanistan,” according to State Department spokeswoman Jen Psaki. “The office must not be treated as or represent itself as an embassy or other office representing the Afghan Taliban as an emirate, government or sovereign,” Psaki said. Psaki said Qatar has had the sign with the “Islamic Emirate of Afghanistan” name taken down. Karzai does not always enjoy broad political support among Afghanistan’s power brokers, but after seeing the Taliban open its new Doha office under its formal name and flag, many lined up behind him. The Taliban gesture “is absolutely undermining the sovereignty of the country and its elected government,” said Abdul Sattar Murad, a member of the powerful Jamiat-e Islami faction, whose leader, former Afghan President Burhanuddin Rabbani, was slain by a suicide bomber claiming to carry a Taliban peace message in 2011. Murad said the hope among lawmakers was that Washington would also step in. Some of Karzai’s anti-American rhetoric in the past has appeared aimed at gaining political favor at home and staving off accusations he is a U.S. puppet, but in this case he does not appear to be posturing, said van Bijlert, who is with the Afghanistan Analyst Network. The Taliban ceremony also upstaged Tuesday’s formal handover of all security operations in Afghanistan from U.S.-led forces to the Afghan army and police. The international force is to be cut in half by the end of the year, and by the end of 2014 all combat troops are to leave and be replaced — contingent on Afghan governmental approval — by a smaller force that would be on hand for training and advising. The U.S. has not yet said how many troops will remain in Afghanistan, but it is thought that it would be a force made up of about 9,000 Americans and 6,000 allies. But she also questioned why the Taliban were able to open a political office in Qatar under their old flag. “It’s not really acceptable for the people of Afghanistan,” she said. The Taliban have for years refused to speak to the Afghan government or the Peace Council, set up by Karzai three years ago, because they considered them to be American puppets. Taliban representatives have instead talked to American and other Western officials in Doha and other places, mostly in Europe. In setting up the office, the Taliban said they were willing to use all legal means to end what they called the occupation of Afghanistan — but did not say they would immediately stop fighting. They also did not specifically mention talks with Karzai or his representatives. Despite all of the developments, the High Peace Council’s Nooristan held out hope talks would eventually still be possible. “We are working to solve these contradictions and fix these problems and act based on the agreements we had before, so the High Peace Council can go there and start the peace talks,” he said. Associated Press writers Kay Johnson and Ahmad Seir in Kabul and Deb Riechmann in Washington contributed to this report.